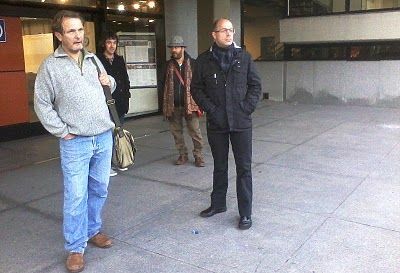 from left to right, Blanco’s stuntman and sometime collaborator Richard Gwyn, Carlos Pardo, Juan Dicent and Niels Frank. A post from Pablo Makovsky, director of the Rosario International Poetry Festival, and a video of us reading ‘Hunger for Salt’ in English and Spanish (translation by Jorge Fondebrider). Also on the festival website a very good quality recording of our rendition of ‘Dusting’. that enters my blood, as a fear that enters my belly? tongue touched with salt my tongue was crazy for? with a devout sobriety, turned utterly to salt. From Being in Water (Parthian, 2001). Dear poet, I had the pleasure of hearing your reading with Pablo, the last day of the festival. To me, it was a real priviledge to be in the same festival as you. Igualmente fue un placer para mi también encontrarte, aunque brevemente.